Join us as Vancouver Whitecaps FC kick off against LA Galaxy this Friday, April 5th at 7:00pm! The best patio party in Vancouver kicks off at 5:00pm on Terry Fox Plaza (weather permitting) where we will be serving $6.25 house-made all beef burgers and Stanley Park Trail Hopper IPA 12oz cans for just $5.00. 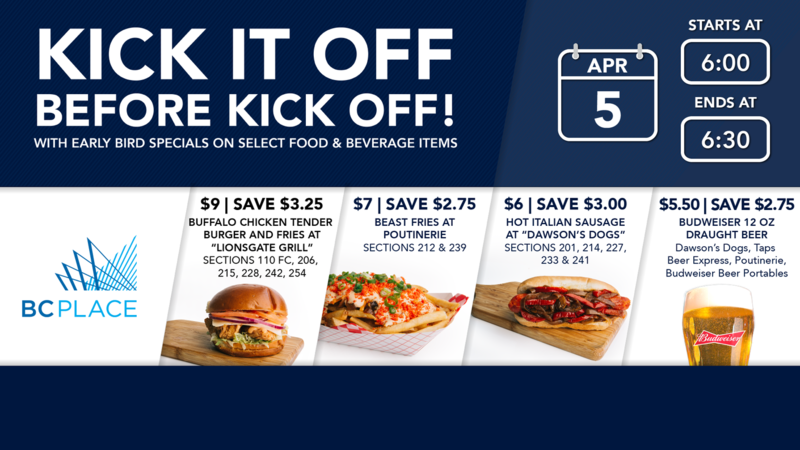 After the Party on the Patio, head inside BC Place for some delicious food and drink specials – served until 6:30pm. NEW! $3.25 OFF BUFFALO CHICKEN TENDER BURGER AND FRIES! Buffalo chicken tenders, crisp lettuce, tomato, onion, jalapeno Havarti cheese, Frank's RedHot & mayo. NEW! $2.75 OFF BEAST FRIES! Caramelized onion, cheddar cheese, Thousand Island dressing. NEW! $3.00 OFF HOT ITALIAN SAUSAGE! Sauteed pepper & onion and a soft-bite bun. $2.75 OFF BUDWEISER 12oz DRAUGHT BEER! $3.25 OFF ICE CREAM & SODA FLOATS! Tater tots, yellow cheddar, house cheese sauce, jalapeno, sour cream, fresh salsa. Click here for more match day and spectator information.